Welcome to New Stanton's first ever full service pet styling salon! 2009 Quest for the Best poll. We would like to thank ALL of our loyal customers who voted for us. Keep up to date with all of our events on Facebook! 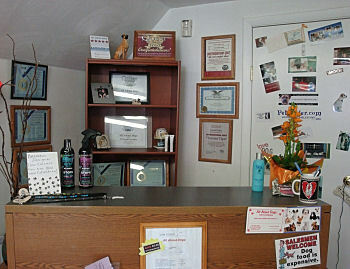 Owner Crystal Foschia, having over 20 years experience in the grooming industry and years of serving the animal community, proudly opened the doors to her salon in 2006 offering Westmoreland County the finest professional grooming services. We make certain that our clients comforts and needs are taken care of during their visit with us. They are provided with a clean and secure environment. Crystal deeply understands the human-animal bond we share with our pets. All About Dogs knows that your pets are companions, friends and part of your family. Crystal communicates honestly with her clients in regard to their pets. Crystal's love of dogs, experience, commitment, and reputation brings clients back to her time and time again. All About Dogs has enjoyed many positive reviews from among many in the community. Our staff participate regularly in ongoing education to master their skills in the grooming industry so that we may bring to our clients exclusively the latest trends, styles and products available for their pets skin and coat. Call today to schedule an appointment for your "Best Friend"